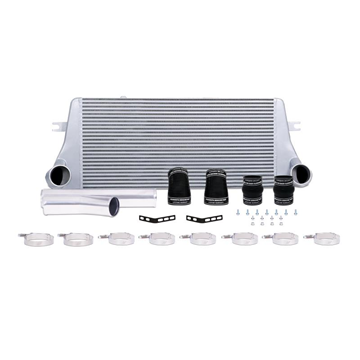 1999-2003 Ford 7.3L Powerstroke - The Mishimoto intercooler is manufactured for high power and durability, thanks to its increased core volume, efficient tube-and-fin core, and aluminum end tanks. 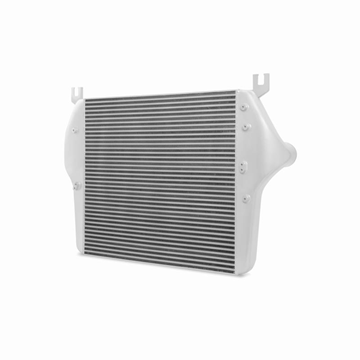 Lower EGT's, reduce intake air temps and increase horsepower/torque with this heavy duty intercooler made specifically for the 2003-2007 Ford 6.0L Powerstroke - pressure tested to withstand 100+psi! 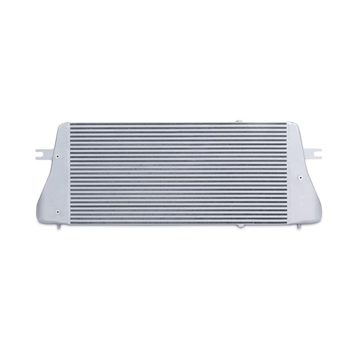 2003-2007 Ford 6.0L Powerstroke - The Mishimoto Powerstroke intercooler features a core with greater volume than the factory cooler; this results in numerous performance benefits including increased pressure tolerance and lower EGTs. 2003-2007 Ford 6.0L Powerstroke - This kit has everything you need to improve airflow, substantially lower air charge temperatures, reduce EGTs, and support your truck at any power level. 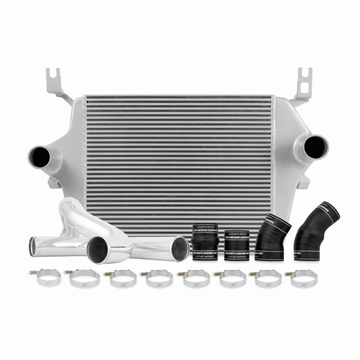 Mandrel bent aluminum polished intercooler pipes, silicone boots and clamps included. 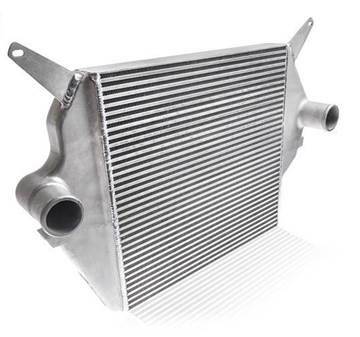 2008-2010 Ford 6.4L Powerstroke - The Mishimoto 6.4L Intercooler is manufactured with heavy-duty cast aluminum end tanks and a durable bar-and-plate core, designed to decrease intake temperatures, improve airflow, and reduce pressure drop. 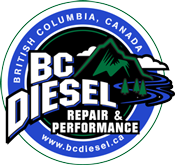 2008-2010 Ford 6.4L Powerstroke - This kit includes everything you need to improve airflow, substantially decrease air-charge temperatures, reduce EGTs, and support your truck at any power level. Mishimoto's heavy duty intercooler is a direct fit for your 2011-2016 Ford 6.7L Powerstroke diesel truck. 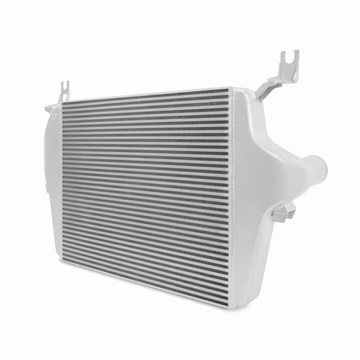 It's bar-and-plate core design and cast end takes generate 22% greater airflow and up to 40 lbs-ft torque improvement over the OEM intercooler. Available in silver, black, or blue colors. 2011-2016 Ford Powerstroke 6.7L - Mishimoto's direct-fit performance intercooler uses a bar-and-plate core design and cast end tanks which generate 22% greater airflow and <40 lbs-ft torque improvement over OEM. Includes both cold/hot side intercooler pipes, boots and clamps. Mishimoto's heavy duty intercooler is a direct fit for your 2017-2019 Ford 6.7L Powerstroke diesel truck. It's bar-and-plate core design and cast end takes generate 22% greater airflow and up to 40 lbs-ft torque improvement over the OEM intercooler. Available in silver, black, or blue colors. 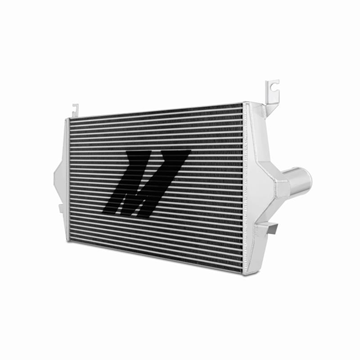 Protect your 1994-2002 Dodge 5.9L Cummins by upgrading to a Mishimoto intercooler. 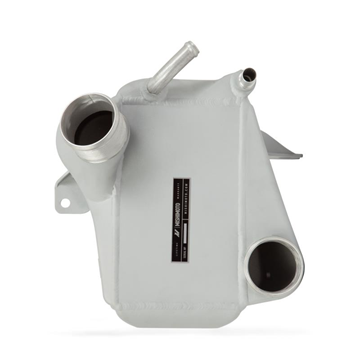 It is precision engineered with durable cast aluminum end tanks and an efficient bar-and-plate core, all designed for improved airflow, lower intake temperatures, and improved EGTs. 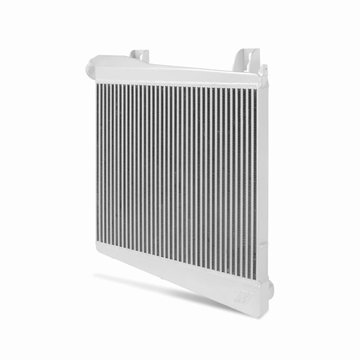 1994-2002 Dodge 5.9L Cummins - The Mishimoto Cummins intercooler features a 47% increase in core volume and is 50% thicker compared to the factory cooler. Includes 3" intercooler pipes, boots and clamps. 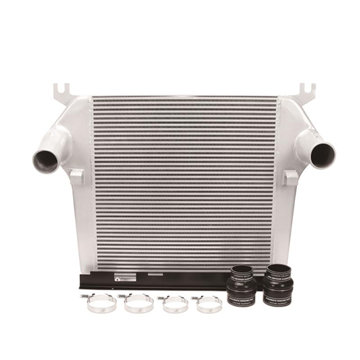 2003-2009 Dodge 5.9L / 6.7L Cummins - The Mishimoto intercooler is manufactured with robust cast aluminum end tanks and a dense bar-and-plate core which provides decreased intake temperatures, improved airflow, and reduced pressure loss. 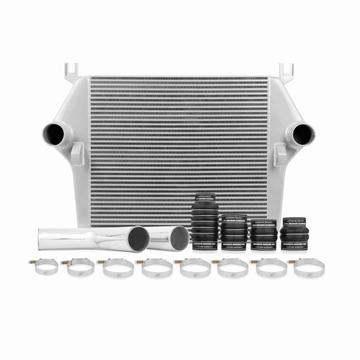 2003-2007 Dodge 5.9L Cummins - This kit includes everything you need to improve airflow, substantially decrease air-charge temperatures, reduce EGTs, and support your truck at any power level. Comes with 3.5" intercooler pipes, boots & clamps. 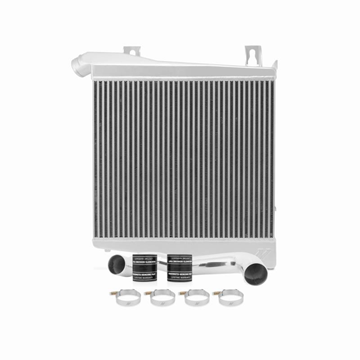 2010-2012 Dodge 6.7L Cummins - The Mishimoto Cummins intercooler is manufactured with robust cast aluminum end tanks and a dense bar-and-plate core, providing decreased intake temperatures, improved airflow, and reduced pressure loss. 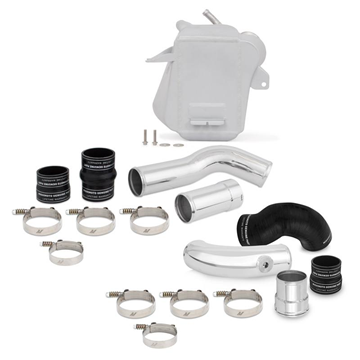 2007.5-2009 Dodge 6.7L Cummins - This kit includes everything you need to improve airflow, substantially decrease air-charge temperatures, reduce EGTs, and support your truck at any power level. Comes with 3.5" intercooler pipes, boots & clamps.